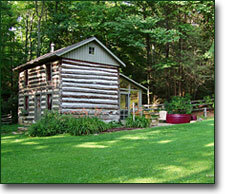 The Three Sisters cabin is a classic Virginia Appalachian 2 story log cabin. Its peaceful feel and pure and simple character make it a most unique rental property. It is also one of only a few surviving 2 story Virginia cabin rentals along the Blue Ridge Parkway. Sorry, this cabin isn't in a big resort area and it doesn't have a game room with a pool table and foosball. But if you are looking for a great get away in the mountains of Virginia, if you are looking to relax and enjoy the beauty of God's creation then Three Sisters is the place to go. The Three Sisters cabin has been fully restored and carefully modernized. You will step back in time when you visit Three Sisters. Even though the Three Sisters is a rustic cabin setting that will transport you into a different age you won't be "roughing it". This Virginia cabin rental is equipped with everything you need to make your stay more than comfortable. 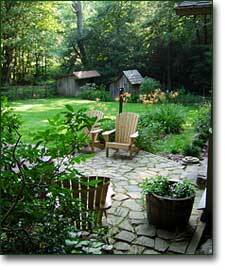 And this Virginia cabin rental is located in the heart of the Blue Ridge Mountains. The Blue Ridge Mountains are one of the most popular destinations in the Southeastern United States and the Blue Ridge Parkway runs right through Virginia. The Blue Ridge Parkway is sometimes called "America's Favorite Drive". It provides both beautiful scenery and close-up viewing at the natural and cultural history of the southern Appalachian mountains. While you are vacationing in Virginia consider staying at the Three Sisters Cabin, I know you will enjoy the experience. For other cabin and vacation accommodations throughout Virginia we recommend the service below.